The silence is cripplingly contagious, filling the theater with the same blaring quietude the protagonists are forced to live in. The auditory softness of the film is meant to lull us into a sense of security, but like Charlie Brown and the football, we are never really given the chance. As soon as our guard is down, the film is quick to remind us that we should be in muscle-tensed attention at all time. 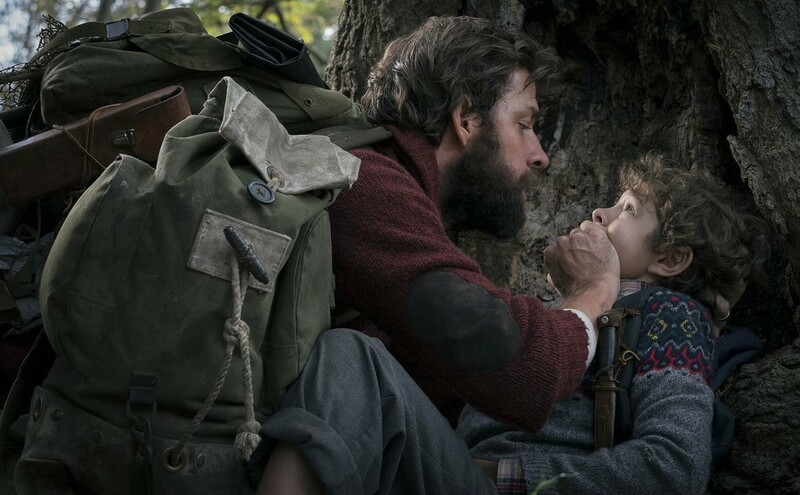 “A Quiet Place” takes full advantage of its conceit, juxtaposing moments of vacuous silence with sudden bursts of piercing punctuations. The film uses American Sign Language (ASL) for the majority of the dialogue very organically, creating this world where it is a necessary survival tool. At no point does the use of ASL feel like it is being used as a gimmick, but rather a fresh approach director/co-writer/actor John Krasinski seamlessly incorporates into the story in a respectful and substantial way. Krasinski may be new to directing, but he displays a fundamental understanding of one of the toughest genres to master: horror. I’m not talking about cheap, predictable horror films, which are easy to master. The true measure of a good horror film is how much it engages with the audience and vice versa. Krasinski manipulates sound and silence to create his jump scares. The jump scares may seem cheap, but they are used skillfully and very effectively. Krasinski channels popular horror films like “Alien” to create a tense, uneasy environment where the audience feels like their survival is tied to the characters. Every element, from the sound design to the subtle visual beauty, keep you engaged, but the story is what captures your attention from beginning to end. Along with Krasinski, writers Bryan Woods and Scott Beck create a post-apocalyptic world where the enemies are armored creatures attracted to loud sounds. We are never explicitly told the specifics, but breadcrumbs are scattered throughout the film in headlines of newspapers and magazines. They understand the audience doesn’t need every single thing explained to them. Instead, they give us so little that the suspense (like the silence) becomes a tangible character in the film, one whose backstory we are left to figure out, and whose future is left to our imagination. To many people, fear of the unknown is much more terrifying than any defined creature or monster. Like many of the contemporary horror films that have come out in the last few years (like “Hush”, “It Comes at Night, and “Don’t Breathe”), writers are finally starting to realize that horror films need to change in both structure and representation. Beck, Woods, and Krasinski gives us a deaf protagonist in a horror film but at no point do they ever treat her like more of a victim than any other character. Unfortunately, the film does still center around a straight, white male hero character, but the story empowers the female characters and the children, which are usually the first to get slaughtered in these kinds of films. The character development may be on the simplistic side, but the family dynamic the film decides to focus makes it worth it. The ensemble cast is small, but that gives us a more intimate look at each character. Emily Blunt and John Krasinski provide the foundation of the film as the parents, establishing the pitfalls of trying to be both providers and protectors in a relentless world of violence. We witness glimpses of what seems to be the genuine bond Blunt and Krasinski share in real life through their characters, making their performances that much more authentic. The heart of the story is felt through the lens of the children, played by Noah Jupe and Millicent Simmonds. Following Simmonds’ breakout role in “Wonderstruck”, she continues delivering powerful performances that rival that of even the most veteran Hollywood actresses. The reason we see horror films is in the hopes of getting scared. 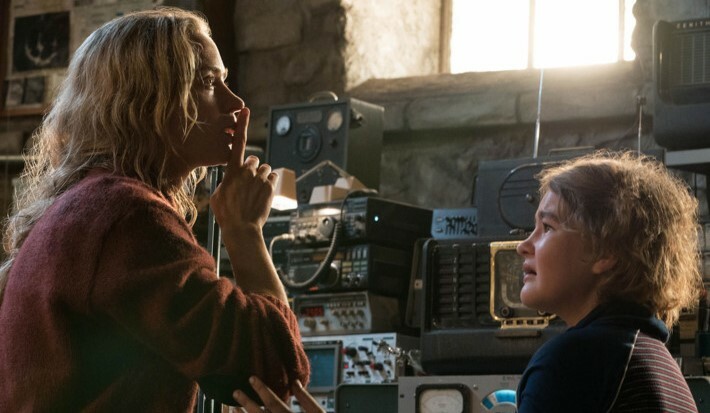 “A Quiet Place” takes a seemingly minimalist approach, but elevates it by infusing complexities even on the smallest level. As a filmmaker, John Krasinski’s attention to detail and mastery of the horror genre will leave you at the edge of your seat in anticipation for his next project.